Sense International India returns with Ahmedabad’s exclusive Charity Cyclothon! Over 300+ cyclists, including people with disabilities, will ride together to celebrate Helen Keller week and raise awareness for a unique cause – ‘deafblindness’, and you’re invited! 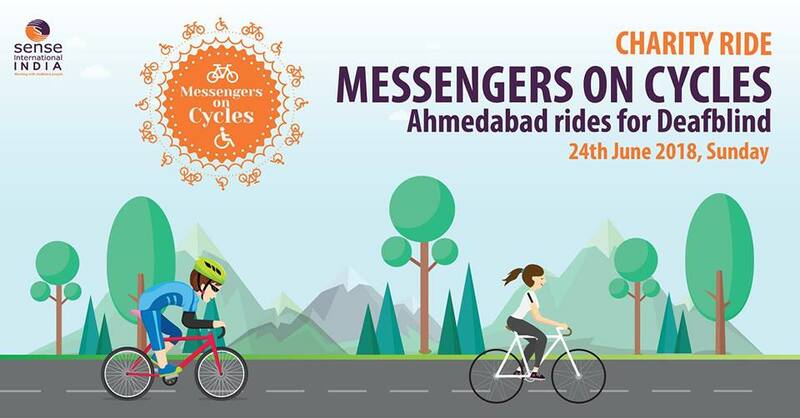 Join in on your bicycles and tricycles as we pedal through Ahmedabad as Messengers on Cycles, building bright futures for over 5,00,000 children and adults with deafblindness in India. A fun 12 KM route for bicycles and 4 KM for tricycles has been demarked for the event and will be announced soon. Age Limit: 12 years and above as on 31st December 2017. Below 12 years, children can ride along with parents. Only 100 cycles are available on rent at the cost of INR 300. For registrations, look for Messengers on Cycle under Sports section in Book My Show. Arrive at least 30 minutes prior to pick up your bicycles with your valid, original, government-issued, photo-ID proof (Pan Card, Aadhar Card, Election ID etc). MYBYKs will be issued against depositing the same and returned only when the bicycle is returned at the same station by you. All participants except those opting for a MYBYK are responsible to use their own bicycle. All participants are required to wear a helmet and comply with traffic rules and regulations. Sense International India is not responsible for personal accidents or loss of personal property along the length of your ride. The nominal registration fee is a donation towards the welfare of children with deafblindness in India. No refund will be given upon the cancellation of the event or no show up of the participant. Drive Safe. Obey Rules. Have Fun! We recommend that you arrive at least 20 minutes prior to the venue to participate in our fun pre-event warm-up events!